£200 Of Free Estée Lauder Items with Estée Lauder Orders Over £100 at Harvey Nichols Get £200 worth of Estée Lauder products when you spend over £100 on Estée Lauder, what's not to love? Givenchy From £90 at Harvey Nichols - Accessories, Clothing & More! This iconic brand always has key pieces that will give you a timeless style. Accessories from £12 At Harvey Nichols Elevate your outfit with great accessories from just £12 at Harvey Nichols. Gift Cards From £50 at Harvey Nichols Not sure what to get someone? Let them decide with a gift card from Harvey Nichols, they won't be disappointed. Kate Spade New York From £60 at Harvey Nichols The perfect upper east side style is at your fingertips, head to Harvey Nichols to check it out! Burberry Women's Collection from £40 at Harvey Nichols Timeless British style, check out the Burberry Women's collection now. Free Returns on Orders at Harvey Nichols Changed your mind on an order? No worries, you get free returns at Harvey Nichols. The New Neutrals Collection from £30 at Harvey Nichols See the newest collection in this season's hottest shades at Harvey Nichols. Harvey Nichols is a world-renowned chain of luxurious department stores stocking everything from premium food and wine to fashion and beauty products. The classy chain of department stores Harvey Nichols first graced London with its presence back in 1831, as a linen shop on the corner of Knightsbridge and Sloane Street. All merchandise is hand-picked and given the Harvey Nichols seal of approval. Harvey Nichols has 7 stores located in the UK and Ireland. It also has a new beauty concept store in Liverpool, called Beauty Bizarre. The brand manages to balance niche with everyday luxury, guaranteed to please all its customers under one roof. If you love a good few hours or even a day in the large format Harvey Nichols stores, like the flagship London store, there’s no need to leave when you want to grab some lunch or a drink. Every store has a luxury food market, restaurant, cafe or brasserie to keep you going when you need a break from all the shopping. For those who prefer a quieter, more personalised shopping experience, the Harvey Nichols website is a mecca for avid internet browsers. The slick and minimal style of the site makes it very easy to find what you want from a series of drop down menus at the top of the home page. How do I use my Harvey Nichols promotional code? Read the Ts&Cs and proceed to ‘checkout’ to complete your transaction. Sign up to the Harvey Nichols Rewards programme app and get the latest deals on luxury items, while redeeming reward points when you shop. Available for tablets and mobiles on Google Play or the Apple App store. Can I order Harvey Nichols products online and collect in store? Yes, simply choose your closest store and wait for an email telling you when it's ready for collection. This is a free service. Can I buy Harvey Nichols gift cards? Yes, you can purchase gift cards in store, which are packaged in a gorgeous Harvey Nichols branded box, whereas gift vouchers can only be bought online. Gift vouchers are presented to the recipient in a wallet and envelope. Is there a stylist service at Harvey Nichols? Harvey Nichols deliver to all mainland areas of the UK. Hampers and Same Day Delivery - Prices vary. For more info, browse the ‘delivery’ page of the website. Returning an item is very easy with Harvey Nichols, simply take the item into one of the stores, or send it back via the Post Office. For more info, check out the ‘Returns’ page of the website. Go to the ‘Store’ page of the website for individual opening times for all 8 UK stores. Does your look change with the season? Of course it does. And while you're probably well aware that a trip to Harvey Nicks is all you need to get that fresh new glow, we're going to tell you again, especially when you know that you can use your Harvey Nichols discount code to save on your new acquisitions. From dresses to tasty superfood, wine and shoes too - Harvey Nichols is all you need to combine fun and luxurious living. Stick with vouchercloud and you style fiends out there can indulge in those designer treats each season without damaging your budget. 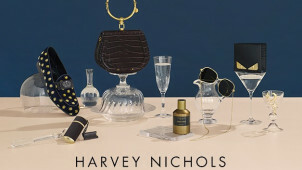 Harvey Nichols like to reward loyal customers, so if you are a die-hard fan and really buy into the brand’s values and eclectic product ranges, it’s definitely worth signing up to the newsletter. Letting you stay in the loop about Harvey Nichols free delivery, while this will trump any student discount too - get bang up-to-date this year with need to know new designers, special sales previews, fashion show invitations and restaurant news and events. Staying ahead of the fashion pack has never been easier! The beauty brand that's in the Harvey Nichol's spotlight is the one and only Fenty Beauty. Created by Rihanna, this is a stunning range which was designed to empower women everywhere. If you've ever struggled to find the right shade in foundation, highlighter and other makeup bag must-haves - the future is bright. Now you can get those killer makeup looks from Fenty Beauty. Shop matt lipsticks to brighten up your pucker, while there is much more to save on too using your Harvey Nichols promo code from vouchercloud. For your everyday look and to go glam for date night - Rihanna has got your back.